What has happened in your organisation. What should you do to solve and optimise key organisational issues. These data-driven insights make your organisation more focused, efficient and profitable. The following is a sample of the data analysis methods with which we are familiar. 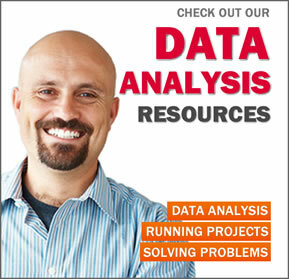 See our Data Analysis pages for how these techniques can be used to create significant value for the various departments within your organisation. Classifying items based on their characteristics and attributes. For example, can be used to estimating a person’s annual income based on their address, gender and age. Identify which natural groups of items go together. Similar to Association however in Clustering the groups are determined by the algorithms. Used in market research to determine the value that consumers place on the trade-offs between two or more features or benefits of a product. Helps to evaluate different pricing points. Similar values are grouped together in order to reduce the volume and complexity of the analysis. Explore associations between sets of categorical, rather than continuous variables. Provides a means of displaying or summarising data in two-dimensional graphical form. Analysis of customer information and behaviour to improve an organisation’s sales, marketing & CRM strategies. Analysing a data set to determine its main characteristics, deficiencies and suitability for analysis. Extracting data from various systems and then restructuring, reorganising and merging it into a homogeneous format, in preparation for data analysis. A process for the collection, integration, storage and deletion of organisational data. This can include any applicable unstructured data and large data volumes. Practice of searching through large amounts of data to identify useful patterns, abnormalities, relationships and trends. Removal and/or merging of duplicate records within a data set to improve its accuracy. Identification of patterns, abnormalities, relationships and trends to describe what has happened within your organisation. Identify when a behaviour has deviated from its expected normal. Using historic data to predict what is likely to happen in the future. Optimisation methods that mimic the ‘survival of the fittest’ selections that are seen in nature. Detailed analytical and statistical study to validate or reject hypothesis of why something is happening within your organisation. Machine learning and artificial intelligence systems that have the ability to learn and make decisions without being explicitly programmed. A computer-based simulation that determines the most likely scenario outcome based on a series of random inputs. Statistical technique to collectively analyse data from two or more variables to determine how they relate to one other. A computer system that mimics the way the human brain works. Used to identify relationships in sets of data and automate decision making. Using linear and non-linear programming, genetic search, and simulated annealing. Detection and remove of irrelevant ‘noise’ from a data set. Used to increase the presence of rare data, when there is not enough data to analyse. Identification of patterns, abnormalities, relationships and trends within a data set. Optimise selling prices from analysing product demand, pricing, promotions, fixed and variable costs, competitors’ offerings, economic factors, inventory and seasonal conditions. Statistical method for determining and exploring the relationships between variables. Used when the volume of data is greater than the available budget, hardware and time limits. The sampled data set should be big enough to contain the significant information, but small enough to be quickly processed. Monitor your organisations success of over time by comparing key performance indicators (KPIs) to budgeted targets. Includes creation of new KPIs if required. The art of subdividing a homogenous market into identifiable segments, each with similar characteristics. The goal is to create a marketing mix that matches your customer expectations in each target segment. A method for finding the global maximum (or minimum) in a large search space. Building a model that represents the behaviours & characteristics of a real-world system. The model is run with varying input parameters to determine expected outputs. Analysis of blogs, social media networks and review sites to identify consumer trends, sentiments and behaviours, in order to improving strategic decision making. Analysis of geographic data to explain patterns in human behaviour. Determining the amount of time before a particular event (eg. death or mechanical failure) occurs. Deriving information from text sources. This includes summarising documents, sentiment analysis and document classification. Using patterns within a sequential series of events to predict what is likely to happen in the future. Determining a variable pricing strategy in order to maximize profits from a fixed and perishable resource. Based on understanding, anticipating and influencing the consumer’s behaviour. Data analysis is a rapidly evolving science. If there is a data analysis method or technology that you are looking for that we have not listed, then please feel free to contact us on 1300 788 662 for a friendly, confidential & obligation-free discussion or submit the form below.